This second-round tournament game is not particularly long in terms of the total number of moves, but the struggle involved certainly felt long-lasting and intense. As the middlegame kicks off on move 16 with White and Black playing on opposite wings, my opponent and I engage in a tense maneuvering battle which builds to a flurry of tactics around the move 40 time control. This game is a good illustration of how important it is to spot key ideas and play them in a timely fashion. In my case, spotting the idea of using an exchange sacrifice to clear the way for my advanced a-pawn should have been the winning one, but it was initiated one tempo later than ideal, a fact which gave Black his own advanced pawn on d3 that eventually won the game for him. Despite the eventual disappointing result, I still felt that this type of game, which revolved around an exciting strategic struggle and tactical clashes, was a great experience and central to why I play chess. 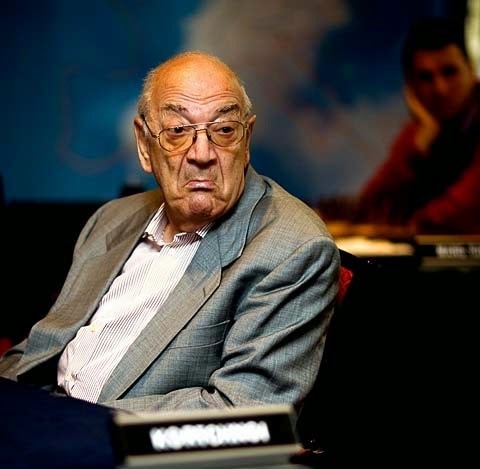 I've always been entertained by Viktor Kortchnoi as well as learning from his games (with a lot of learning still left to do). He's currently playing in the Zurich Legends event, in this case a rapid match against fellow legend Wolfgang Uhlmann. As noted in this ChessBase article, Kortchnoi also has the most recorded games in the ChessBase database, a testament to his staying power and love of the game.